On December 10, 1971, a John Sinclair Freedom Rally was held at University of Michigan in Ann Arbor. Sinclair was a Michigan activist who was sentenced to 9 1/2-10 years for possession of a couple of marijuana joints. Yippie! Jerry Rubin organized the event, as part of a series that lead up to the 1972 Republican convention. On the bill were Michigan natives Stevie Wonder and Bob Seeger, Phil Ochs, Steve Miller, Commander Cody, VIP Allen Ginsberg, Chicago Eight members David Dellinger, Renne Davis and Bobby Seale (ungagged), and, in his first American performance since the break up of the Beatles, John Lennon with Yoko Ono. Stevie Wonder, aged 21, came on at 2:30 AM and said, "This is to any undercover agents in the crowd" and played "Somebody's Watching You." Later a FOIA investigation revealed FBI agents were taking down every word. Lennon came out, announced, "The Pope smokes dope" and performed his composition "The Ballad of John Sinclair" and three other original songs with Yoko. Two days later, an appellate court freed Sinclair on bail. Harvard psychiatrist Lester Grinspoon, the author of Marijuana Reconsidered, met Lennon when he testified as an expert witness at his INS hearings that Attorney General John Mitchell had engineered. Grinspoon, who tried marijuana deliberately after studying it for years, told Lennon that cannabis appeared to make it possible for him to "hear" his music for the first time. Grinspoon writes, "John was quick to reply that I had experienced only one facet of what marijuana could do for music, that he thought it could be very helpful for composing and making music as well as listening to it." 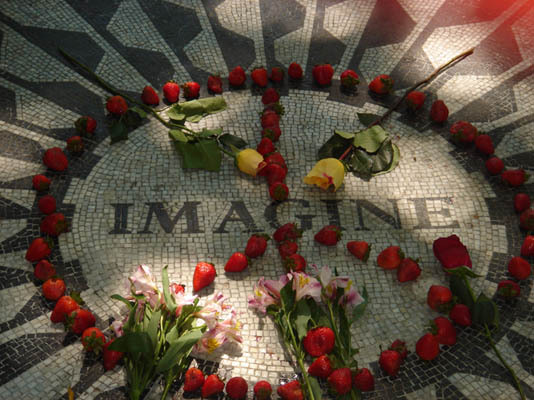 The 2006 film "The U.S. vs. John Lennon" is an excellent account of Lennon's trials. In his autobiography Confessions of a Raving, Unconfined Nut, Paul Krassner recounts smoking with John and Yoko in 1972. Lennon discounted theories that Jimi Hendrix, Janis Joplin and Jim Morrison may have been political assassinations. "No, no," John said, "they were already headed in a self-destructive direction." A few months later, he reminded Krassner of the conversation and added, "Listen, if anything happens to Yoko and me, it was not an accident." But Lennon lives. At the February 10, 2006 Olympic opening ceremonies in Turin, Italy, Yoko introduced Peter Gabriel who sang "Imagine," a song that has become the world's peace anthem.